The penultimate card in the Major Arcana, and the cycle is almost complete. The Judgement card heralds a time of accomplishment and rewards for past efforts, and opportunities not to be ignored. It's about taking stock, and consideration of a brand new phase in life. 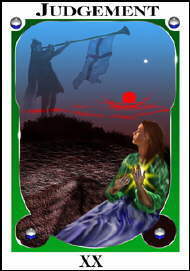 The negative aspects to this card focus on fear of change, self doubt, delays and a refusal to change and learn from past mistakes.